Ever wished your reptile wouldn’t get sick? Ever wished that your reptile wouldn’t get sick? We take a look at what can make them vulnerable. Their daily feed impacts on their health. You are what you eat. A reptile’s body cannot be made up of elements it has not consumed. So let’s look at the impact of feed as, out of the four impacts listed above, it is one you can easily adapt to reduce the likelihood of sickness in your reptiles. What is in good food that helps to keep sickness at bay? Let’s take a look at the components of feed. We are not looking here at whether the item of feed is a live food or fruit/vegetable but rather what any of these might be made up of, what they might have to offer to your reptiles. On our own food, such as packaged items bought in the supermarket, you usually see listed the contents in percentage terms of protein, fats, starch, fibre, sugar and salt. You are also likely to see some levels of various vitamins or minerals listed. You are not likely to see some of the other elements itemised, such as the amino acids, health giving yeasts, probiotics which foods are comprised of. So out of all these possibilities let’s take a closer look at vitamins and minerals. They are talked about a lot. But why are they considered so important? What do they do? 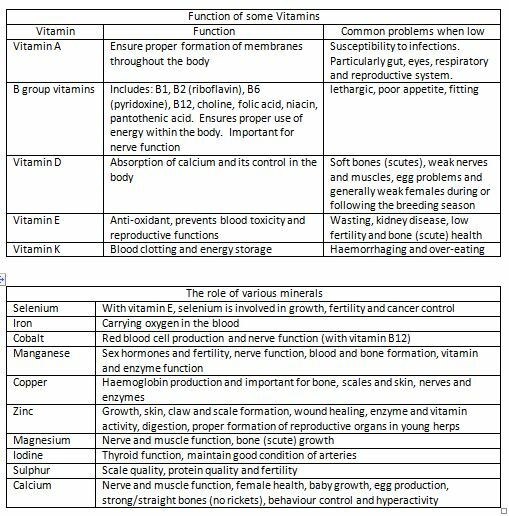 Below is a table, by way of example, highlighting some of the key benefits of vitamins and minerals. This table does not claim to be complete! But hopefully it will give you an idea of the significance, complexity and diversity of impact that vitamins and minerals can have on health. 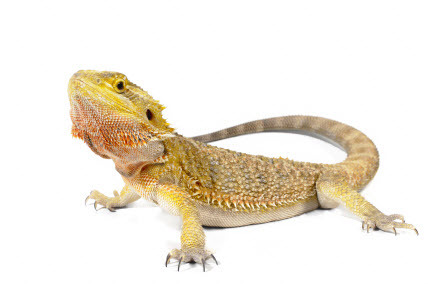 This short and incomplete list probably leaves you wondering what you are supposed to offer your reptiles to help improve their health and to help you lose fewer of your favourite reptiles. The answer is that picking one vitamin as a top up item is not the answer! This is an approach often favoured by people as it is nice to think there is one magic ingredient that will make all the difference. The truth is that, as you can see from the items in the tables, more than one vitamin or mineral can affect a particular issue. For example, both fertility and nerve and muscle function crop up more than once. These vitamins and minerals alone have many complex interactions in the body and need to work together. The real answer is that you and your reptiles need a full and comprehensive blend of all the vitamins and minerals so that the body can undertake all the complex interactions that need to go on every hour of every day. Improving the vitamin and mineral profile of your reptiles diet is a great way to get ahead of the game and keep them healthy, which is to say prevent illness in the first place. It’s so much easier than trying to resuscitate them once they have gone down with an infection of some sort.